Are you on the hunt for the Best Family Halloween Costume Ideas? Look no further than this great list of awesome Group Halloween Costumes everyone in your family will love! It’s so much fun to dress up the whole family in a fun theme for Halloween. There are so many fun, unique and creative Family Halloween Costumes to choose from. So whether you’re going to a Halloween party or just trick-or-treating around the neighborhood, your family costumes will be a total hit! 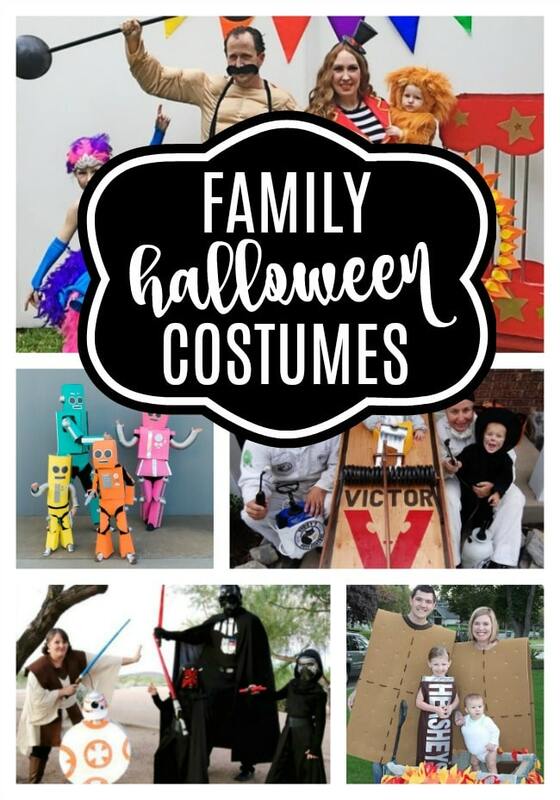 Some fun family costume ideas are Star Wars, Wizard of Oz, Minions, Legos, Angry Birds, Superhero, Super Mario, Frozen, Toy Story and more! If you’re super crafty you can make DIY Family Halloween Costumes in any of these themes, especially the robot family, pest control family, circus family, and S’mores family ideas. Whether you’re looking for Family Halloween Costumes for 3, 4, 5 or 6 people, these family costume ideas will work for you. 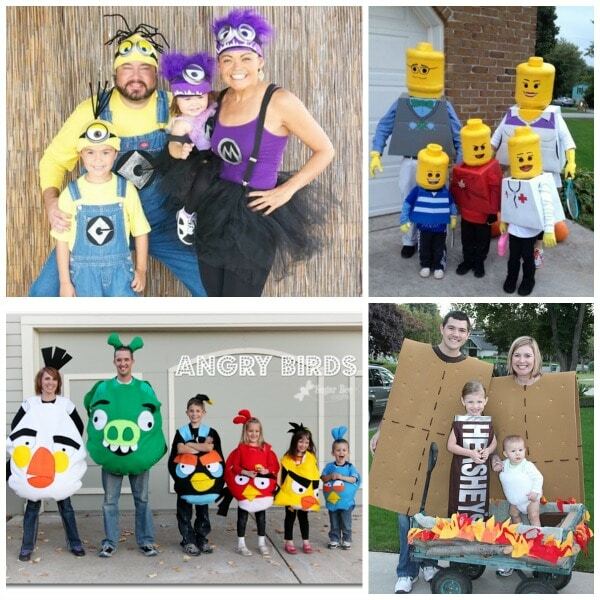 Minions, Legos, Angry Birds and S’mores family costumes are sure to get everyone’s attention at your next Halloween party! S’mores Family: How adorable is this DIY S’mores Family Costume idea? Have one child be the chocolate Hershey bar, another one be the marshmallow – preferably a baby – and the parents can be the graham crackers. Put the kids in a wagon and decorate it to look like a campfire and you’re all set to go trick-or-treating. This Halloween costume idea can definitely be a contest winner at any Halloween party! Lego Family: Does your family love playing Legos? If, so, than this Lego family is the perfect family Halloween costume idea! Angry Birds Family: Maybe your family loves playing Angry Birds. Pick your favorite Angry Birds characters and get ready for some family costume fun! Minions Family: The Minions are a great family costume idea. The boys of the family can be the yellow Minions and the girls can be the purple Minions. Shark Attack Family: This Family Halloween Costume Idea is so clever. Dress the kids as little sharks and the parents can be the surfers. Fun! 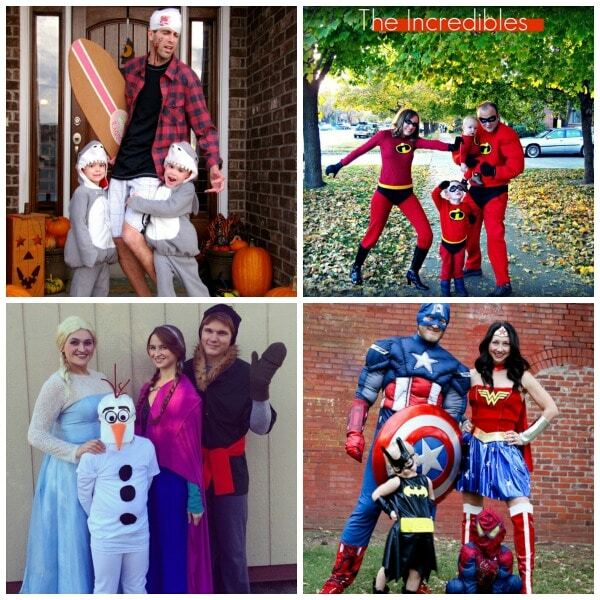 Incredibles Family: The Incredibles are another superhero family costume theme everyone will love. Frozen Family: If your family loves the Disney movie Frozen, dress up as your favorite Frozen characters. Dad can be Kristoff, mom can be Anna or Elsa and the kids can be Olaf. Superhero Family: Are you a superhero family? Show off your inner superhero by dressing up as Wonder Woman, Superman, Batman, etc. There are so many fun superhero to choose from! Super Mario Family: Everyone loves the classic Super Mario game from Nintendo. Dress up as Mario, Luigi, Princess Peach and the mushroom for the best Family Halloween costumes ever! This costume ideas is definitely for any “gamer” family. Circus Family: Everyone thinks of their family in some way like a big circus, so why not make the circus family a reality with these fun family costumes. One person can be the lion tamer, another a clown, another person can even be the strongest man on Earth. This family costume idea is perfect for big families, so if you’re looking for family of 5 or family of 6 Halloween costumes, the circus theme is definitely the way to go. Pest Control Family: These Family Halloween Costumes are so clever. Pest Control is a great idea for the entire family. Dress up the baby in the family as the little mouse. The parents can be the exterminators, and the bigger kids can be the other mice. So adorable! Just DIY a mouse trap and you’re all set for the most creative family costumes ever! 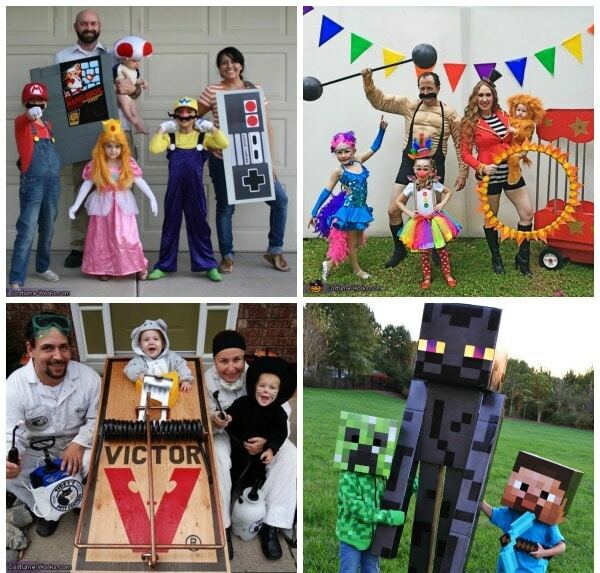 Minecraft Family: Minecraft is a great theme for your family Halloween costumes. So many of the kids today are obsessed with Minecraft and it’s the perfect costumes to DIY if you’re the crafty type. Wizard of Oz Family: The Wizard of Oz is such a classic, so why not make it your family costume idea! Dad can be the tin man, mom can be Dorothy, and the kids can be the scarecrow and little Toto. Star Wars Family: Is your family obsessed with Star Wars? There are so many families who absolutely love the Star Wars movies and characters. 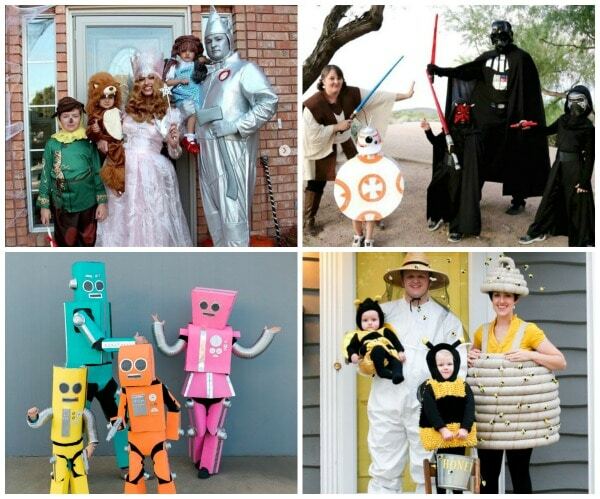 Dress up as your favorite Star Wars characters and make it a big family affair for Halloween. If you’re looking for awesome group costume ideas, Star Wars will be a big hit with the entire family. DIY Robot Family: There’s nothing better than homemade Halloween costumes and if you’re lucky enough to be super creative, you can whip up costumes for the entire family in no time. That’s why we think these DIY robot costumes make awesome Family Halloween Costumes. Bee Hive and Beekeeper Family: Another creative Family Halloween Costume Idea is this Bee Keeper and Bee Hive Idea! Plus, the little ones will look so adorable dressed up as little bumble bees! Harry Pottery Family: What family doesn’t love Harry Potter, right?! Harry Potter is definitely high on our list of the best family costume ideas for Halloween. DIY Mickey and Friends: If you’re family loves all things Disney, why not dress up like everyone’s favorite Disney characters?! Mickey Mouse and Friends are perfect if you have a family full of kids. Dress up the littles as Mickey, Minnie, Pluto, Donald Duck, etc. Everyone will look super adorable. Little Mermaid Family: The Little Mermaid is another great family-favorite movie to base your family Halloween costumes on. Choose from Ariel, the prince, Ursula, etc. for some fun family costumes. Toy Story Family: The Toy Story theme is another great family costume idea for a big family of 5 or 6. There are so many characters from the movie to choose from. Everyone can pick their favorite and head out for some trick-or-treating and Halloween memory-making. Grilling Family: There’s nothing more fun and unique than the grilling family walking down the street on Halloween! 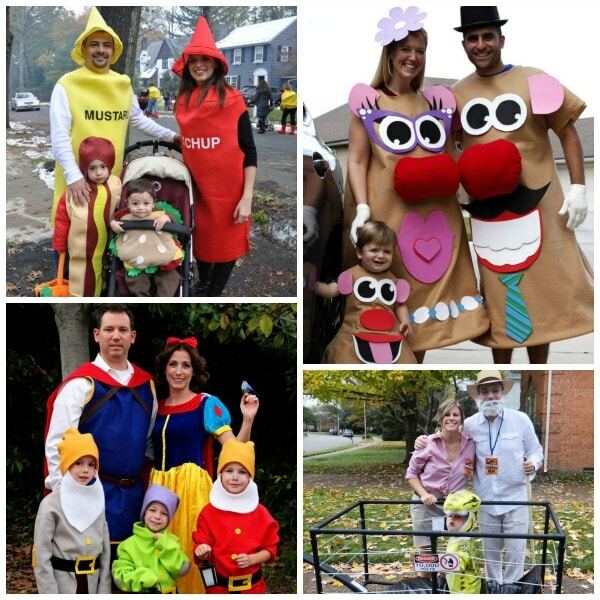 Dress up the family as ketchup, mustard, hamburgers and hot dogs for your family Halloween costumes this year! How fun! Mr. Potato Head Family: Who doesn’t love the classic Mr. Potato Head?! Make this your family Halloween costumes this year. The whole family can dress up as Mr. and Mrs. Potato Heads and kids. Snow White and the Dwarfs Family: This theme is perfect for Family Costumes for 4, 5 or 6 people. The more kids you have the faster you can come up with the seven dwarfs! Jurassic Park Family: Are you a family who loves dinosaurs and better yet the movie Jurassic Park?! If so, this theme will make the perfect Family Halloween Costumes. 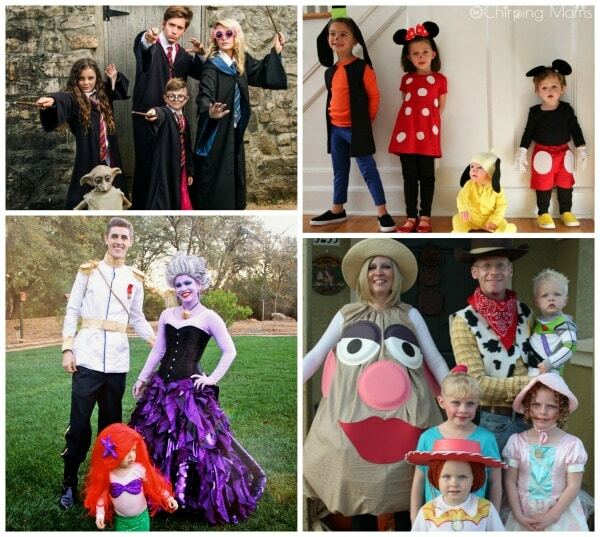 There you have it – the Best Family Halloween Costume Ideas for any size family! Which Family Costume Ideas are your favorites. We would love to know in the comments below. For more Halloween party ideas, follow us on Instagram @prettymyparty and Pinterest and join us in our private Facebook group.